Swimming Pool with Hot Tub (pool may be heated by request for an additional charge). 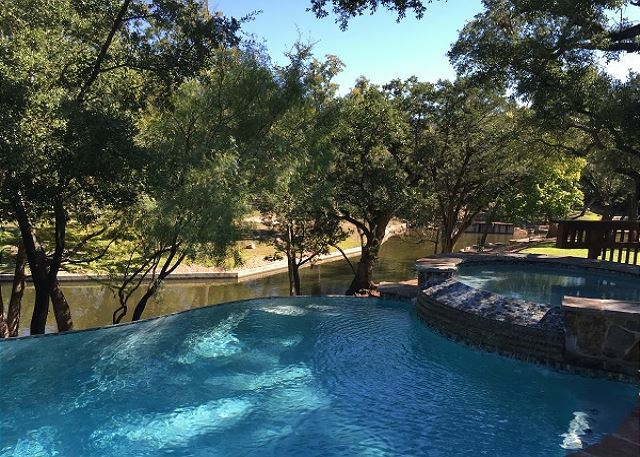 5 Bed/3 Bath one level Mediterranian Style Lake Home with gorgeous waterfront views located on the Llano Arm of Lake LBJ.Sleeps 15. Fooseball table and a card/game table. This home is fully furnished with full kitchen, Keurig Coffee Maker as well as a regular Mr. Coffee, fireplace, Jacuzzi tub in master, washer/dryer, picnic table, horseshoes, large fire pit, charcoal barbeque pit, private creek with waterfalls on 5 acres. 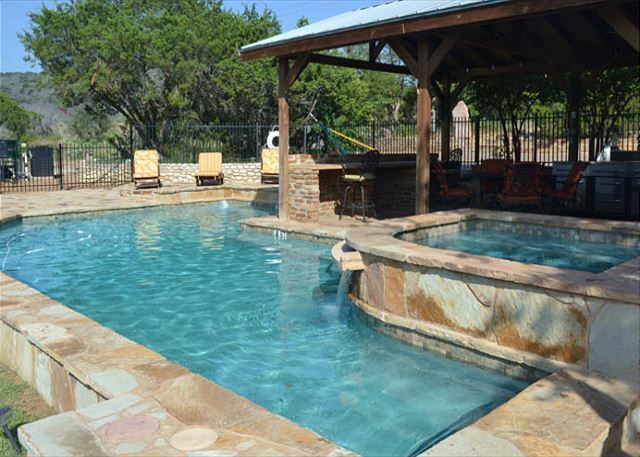 Two Story, Five Bedroom/four bath, loft, sports pool, sleeps 20 Fully furnished log home with 17x31 sports pool. 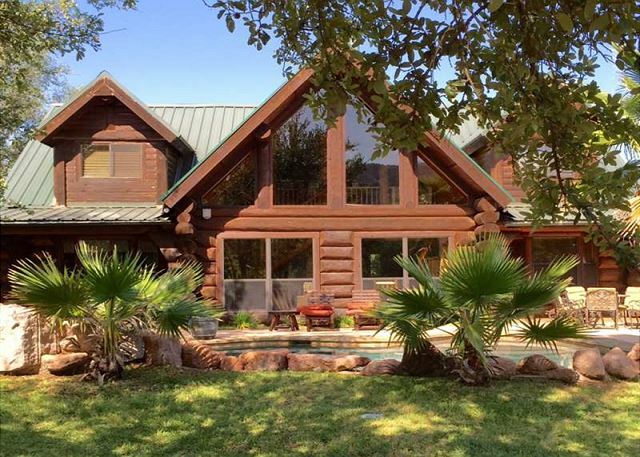 This beautiful log home is situated on 5 acres. You have a pool table and other inside entertainment as well as outdoor games. Pet Friendly 5 bedroom, 5 bath log home, main house/bunk house, private pool/hot tub. Main house has 3 bedrooms, 4 bath. Bunk house has 2 bedrooms/1 bath. For your enjoyment there is a tree house, swing set, horseshoes, sand volleyball, outdoor kitchen. 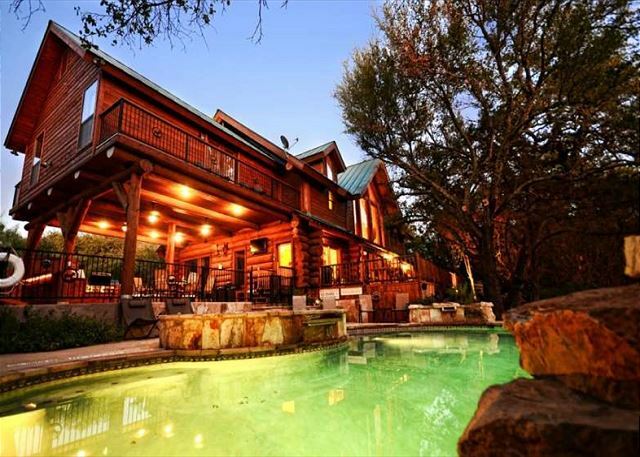 Unique log home featuring breathtaking views of Texas Hill Country, Pool/Hot Tub, 55"-75" 4K TV's, Internet, Pool Table, Air Hockey, Foosball, Ping Pong, and much more. Sleeping 30 people, Kings in every bedroom, this home has it all. Water access 500 yds. 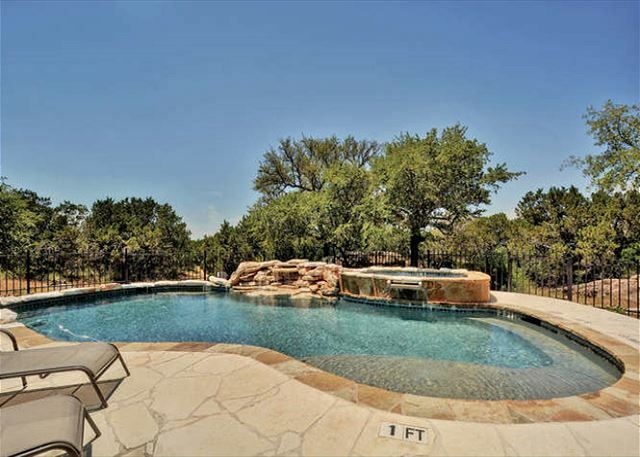 This beautiful Tuscan designed home is the perfect place for your large group getaway. You will find the openness of the kitchen, dining and great room to be the perfect place for everyone to catch up on old times and reminisce about past memories.